Lineage. Constituted 12 Pursuit Squadron (Interceptor) on 20 Nov 1940. Activated on 15 Jan 1941. Redesignated: 12 Fighter Squadron on 15 May 1942; 12 Fighter Squadron, Two Engine, on 26 Jan 1944; 12 Fighter Squadron, Single Engine, on 6 May 1946; 12 Fighter Squadron, Jet, on 23 Dec 1949; 12 Fighter-Bomber Squadron on 20 Jan 1950; 12 Tactical Fighter Squadron on 1 Jul 1958; 12 Fighter Squadron on 1 Oct 1991. Inactivated 30 Sep 2007. 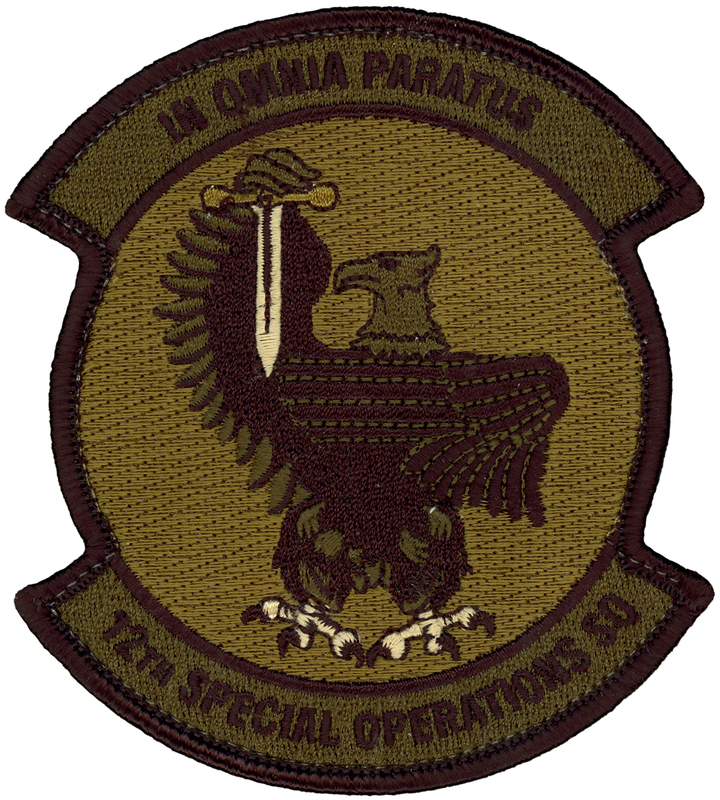 Redesignated 12 Special Operations Squadron on 1 Jun 2015-. Assignments. 50 Pursuit (later, 50 Fighter) Group, 15 Jan 1941 (attached to 7 Interceptor [later, VII Fighter] Command, 10 Feb-17 Aug 1942); 15 Fighter Group, 18 Aug 1942; US Army Forces in South Pacific, 1 Dec 1942; XIII Fighter Command, 13 Jan 1943; 18 Fighter (later, 18 Fighter-Bomber) Group, 30 Mar 1943 (attached to Air Task Group 5, Provisional, 27 Jan-19 Feb 1955; Air Task Force 13, Provisional, c. 3 Sep-30 Nov 1955; 49 Fighter-Bomber Group, 7 Aug 1956-14 Mar 1957; 18 Fighter-Bomber Wing, 15 Mar-15 Aug 1957; Thirteenth Air Force, 16 Aug-1 Sep 1957); Thirteenth Air Force, 2 Sep 1957; 18 Fighter-Bomber (later, 18 Tactical Fighter) Wing, 25 Mar 1958 (attached to 2 Air Division, 1 Feb-15 Mar 1965 and 15 Jun-25 Aug 1965; 314 Air Division, 23-29 Jan 1968); 18 Tactical Fighter Group, 1 May 1978; 18 Tactical Fighter Wing, 11 Feb 1981; 18 Operations Group, 1 Oct 1991; 3 Operations Group, 28 Apr 2000-30 Sep 2007. 27 Operations Group, 1 Jun 2015-. Stations. Selfridge Field, MI, 15 Jan 1941; Key Field, MS, 3 Oct 1941-c. 19 Jan 1942; Cassidy Field, Christmas Island, 10 Feb 1942, Palmyra Island, 22 Oct 1942; Efate Island, New Hebrides, 19 Nov 1942 (operated from Fighter Strip No. 2, Guadalcanal, 19 Dec 1942-6 Feb 1943); Fighter Strip No. 2 (later, Kukum Field), Guadalcanal, 7 Feb 1943 (operated from Treasury Island, Solomon Islands, 19 Feb-Aug 1944); Mar Drome, Sansapor, Dutch New Guinea, 23 Aug 1944 (air echelon operated from Guadalcanal, Aug 1944; a portion of the squadron operated from Morotai, 8 Nov 1944-10 Jan 1945); Lingayen, Luzon, 13 Jan 1945; Hill Strip, San Jose, Mindoro, 27 Feb 1945 (rear echelon operated from Lingayen, 28 Feb-4 Apr 1945 and became the advance echelon at Moret Field, Zamboanga, Mindanao, on 24 Apr 1945; an air echelon operated from Puerto Princesa, Palawan, 26 Apr-11 May 1945); Moret Field, Zamboanga, Mindanao, 4 May 1945 (a detachment operated from Sanga Sanga, Sulu Archipelago, 11 Jun-Aug 1945, and another detachment operated from Tacloban, Leyte, 25-c. 30 Jul 1945); Tacloban, Leyte, 5 Nov 1945; Puerto Princesa, Palawan, 15 Feb 1946 (a detachment operated from Florida Blanca AAB, Luzon, 24 Jun-16 Jul 1946); Florida Blanca AAB, Luzon, 17 Jul 1946; Clark Field (later, AFB), Luzon, 16 Sep 1947 (operated from Johnson Field, Japan, 28 Jun-c. 11 Jul 1949); Taegu AB, South Korea, 28 Jul 1950; Ashiya AB, Japan, 8 Aug 1950; Pusan-East AB, South Korea, 8 Sep 1950 (a detachment operated from Pyongyang-East, North Korea, c. 5-19 Nov 1950); Pyongyang-East, North Korea, 20 Nov 1950; Suwon AB, South Korea, 3 Dec 1950; Chinhae, South Korea, 22 Dec 1950 (a detachment operated from Suwon AB, 22 Dec 1950-4 Jan 1951; part of the squadron operated from Suwon AB, 24 Mar-8 May 1951, and another part from Pusan-West AB, South Korea, 24 Mar-23 Apr 1951; operated from Seoul AB, South Korea, 8 May-9 Aug 1951 and 19 Aug-30 Sep 1951; operated from Hoengsong, South Korea, 1 Oct 1951-1 Jun 1952); Hoengsong, South Korea, 2 Jun 1952; Osan-ni AB, South Korea, 11 Jan 1953; Kadena AB, Okinawa, 30 Oct 1954 (operated from Yonton Auxiliary AB, Okinawa, 10 Nov-11 Dec 1954; deployed at Tainan AB, Formosa, 27 Jan-19 Feb 1955 and c. 3 Sep-30 Nov 1955; detachment operated at Clark AB, Philippines, 1-14 Aug 1957); Clark AB, Philippines, 15 Aug 1957; Kadena AB, Okinawa (later, Japan), 25 Mar 1958 (deployed at Da Nang AB, South Vietnam, 1-19 Feb 1965; Korat RTAFB, Thailand, 8 Feb-15 Mar 1965 and 15 Jun-25 Aug 1965; Osan AB, South Korea, 23 Jan-13 Jun 1968); Elmendorf AFB, AK, 28 Apr 2000-30 Sep 2007. Cannon AFB, NM, 1 Jun 2015-. Aircraft. P-35, 1941; P-36, 1941; BT-13, 1941; P-40, 1941-1942; P-39, 1942-1943, 1943, 1944; P-400, 1943; P-38, 1943-1946; P(later, F)-47, 1944, 1946, 1947-1948; P(later, F)-51, 1946-1947, 1948-1950, 1950-1953; P(later, F)-80, 1946, 1949-1950; F-86, 1953-1956; F-84, 1956-1957; F-100, 1957-1958, 1958-1963; F-105, 1962-1972; F-4, 1975-1980; F-15, 1980-2007. Operations. Patrols over the Pacific from Christmas Island, Feb-Oct 1942. Combat in South and Southwest Pacific, 19 Nov 1942-14 Aug 1945. Combat in Korea, 1 Aug 1950-8 Jan 1953 and 25 Feb-27 Jul 1953. Combat in Vietnam, 1 Feb-15 Mar 1965 and 15 Jun-25 Aug 1965. Stood alert in South Korea, 23 Jan-13 Jun 1968, after seizure of the USS Pueblo by North Korea. Supported air defense alert capability in Southeast Asia, 1968-1972. May 1972-Nov 1975, remained at Kadena AB without personnel or equipment. Remanned and reequipped with F-4 aircraft in late Nov1975; through 1980, flew offensive and defensive exercises in support of its wing, 313 Air Division, and PACAF. Converted to F-15 aircraft in 1980. In 1981, earned the Hughes Trophy in recognition as the outstanding fighter squadron in the USAF. On 5 Nov 1999, stood down at Kadena AB, Japan; moved without personnel or equipment to Elmendorf AFB, AK and joined 3 Wing on 28 Apr 2000. Since 2000, performed offensive and defensive counter-air missions with current air-to-air weaponry, including night vision goggles (NVG), to achieve air superiority in support of taskings from 3 Wing. Provide remotely piloted aircraft launch and recovery operations. Campaign Streamers. World War II: Guadalcanal; Northern Solomons; Bismarck Archipelago; New Guinea; Leyte; Luzon; Southern Philippines; Western Pacific; China Defensive; Air Combat, Asiatic-Pacific Theater. Korea: UN Defensive; UN Offensive: CCF Intervention; First UN Counteroffensive; CCF Spring Offensive; UN Summer-Fall Offensive; Second Korean Winter; Korea Summer-Fall, 1952; Third Korean Winter; Korea, Summer 1953. Vietnam: Vietnam Advisory; Vietnam Defensive. Decorations. Distinguished Unit Citations: Philippine Islands, 10-11 Nov 1944; Korea, 3 Nov 1950-24 Jan 1951; Korea, 22 Apr-8 Jul 1951. Presidential Unit Citation: Southeast Asia, 25 Jun-25 Aug 1965. Air Force Outstanding Unit Award with Combat “V” Device: 1 Aug 1964-5 Jun 1965. Air Force Outstanding Unit Awards: 1 Dec 1959-30 Nov 1960; 1 Sep 1962-31 Aug 1963; 6 Jun 1965-31 Dec 1966; 1 Sep 1978-30 Sep 1979; 1 Oct 1979-31 May 1980; 1 Jun 1981-31 May 1983; 1 Jun 1983-31 May 1984; 1 Jun 1984-31 May 1986; 1 Jun 1987-31 May 1989; 1 Jun 1989-31 May 1991;1 Jun 1991-31 May 1993; 1 Jun 1993-31 Aug 1994; 1 Sep 1994-31 Aug 1995; 1 Sep 1995-31 Aug 1997; 1 Jan 2000-31 Dec 2001; 1 Jan 2002-30 Sep 2003; 1 Oct 2003-30 Sep 2005. Philippine Presidential Unit Citation (WWII). Republic of Korea Presidential Unit Citations:  Jul 1950-31 Jan 1951; 1 Feb 1951-31 Mar 1953. Republic of Vietnam Gallantry Cross with Palm: 1 Apr 1966-30 Jun 1970. Emblem. Approved 15 Apr 1957.